There is no better way to immerse in Lombok life than through traditional Sasak food, but why limit yourself to just eating it ? 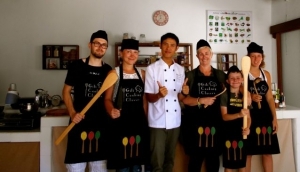 A Lombok cooking class is a great way to get acquainted with the island's unique dishes and exotic herbs and spices. It's also a fine way to meet and mingle with other adventurous foodies.There are classes on the Gili Islands and in Senggigi, the latter offering a full day of food appreciation with a little sightseeing and shopping in traditional markets before being let loose in the kitchen to cook your own spicy Sasak feast.